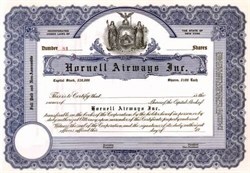 Beautifully engraved unissued certificate from Hornell Airways. This historic document was printed by the Broun-Green Company and has an ornate border around it with a vignette of allegorical women standing next to a shield that bears a mountain and lake scene. Howard Babcock was president of the Hornell Airways.